The Last Fifth Grade of Emerson Elementary is a window into what it feels like when a place you love might get torn down. But the fifth graders in Ms. Hill’s class are not going to let that happen. Each character has a unique personality. Humorous and poetic, this book really shows what it means to stand up and have school spirit. My favorite character in the story is Sydney. I like that she was a little bit tomboyish and girly at the same time. My favorite part is when Shoshanna stood up for herself and tells Hannah Wiles she is not going to be her servant anymore. I really liked this book and I hope Laura Shovan will continue writing poetry. I find that as I get older I have less patience with books that are extremely long. Why are there so many words? Do we really need to talk so much? I never used to read short stories or short novellas, yet now find myself compelled to read more of this kind of literature. Prose poetry (poetry written in prose instead of using verse but preserving poetic qualities) and flash fiction (fiction of extreme brevity) are two types of writing that I am particularly excited about. I liked Brown Girl Dreaming by Jacqueline Woodson because it is a story about the author’s life.The book talks about her family, and I liked that her family is always together.This book is a unique and I would recommend it to everyone. 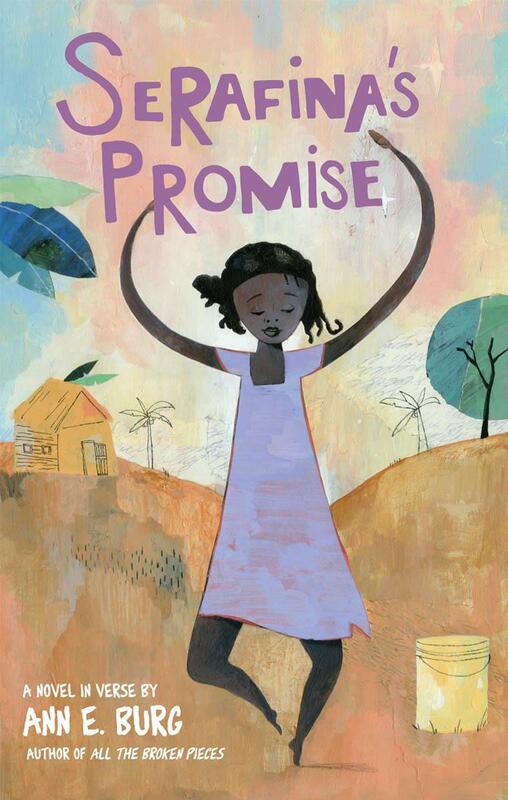 Serafina’s Promise is about a girl who lives in Port-au-Prince, Haiti. All she wants is to go to school to become a doctor with her best friend, Julie Marie. But she also has an oath to her family to work and help them. When a flood reaches her little village she believes all is lost, including her dreams, family, and friends. This beautiful story, told in verse, expresses love, passion, and following your dreams. when the language inside doesn’t match the language outside. help clean up the destruction and start rebuilding. one another through their mutual love of poetry. coherent and touching story about one girl’s journey to find herself. *Note from Eight Cousins: Books that are pre-ordered more than 10 days before publication receive a 20% discount. If you are interested in reviewing Advanced Reader Copies, please contact events@eightcousins.com. Congratulations to Leah, age 17, whose poem “Be Infinite, Look Up”, was selected by YA author Lisa Schroeder as our Digital Poetry Contest winner. You can find Leah’s poem on our website. At the end of the Digital Poetry Contest, we selected 5 poems for the short list and sent them off to YA author Lisa Schroeder. After much deliberation, she has selected the final winner, with the comment “this was hard”. The winning poem will be published on our website tomorrow. Today, however, we wanted to feature the four short list poems. Congratulations to everyone. We were most impressed with your writing! on the separating me and the night. it’s now the new york city skyline. and know i am alive. i think of everyone i spoke to that day. what their facial expressions were. or if i think too much of people. This game gives me everything. How could I live without my passion? But never ever to quit. Working through the thick and thin. My favorite is the time of the kite. Through the sky, my best friend soars and takes flight. Carry our hopes of takeoff away. Bored, my vessel and I will sway. Forces down rain, sleet and snow. The chilling howls, through my head still rings. This drives us away, now inside we must go. But are sent plummeting, lifeless into the grass. I will savor the time when it was only my kite and me. It’s there and it’s going. And your humor becomes ill.
And the food is terrible. While the other helps you fail. Writer Cynthia Grady and illustrator Michelle Wood have put together an intricate collection of poems and quilt-inspired illustrations that focuses on slavery ($17). Grady explains that “Quiltmaking and poetry share similarities in craft” and shows how color, shape, sound, and structure create the overall pattern in both types of art. The poems are unrhymed verse, 10 lines of 10 syllables, which follows the shape of a quilt block. Furthermore, each poem contains three references: biblical, spiritual, and musical, to mimic the three layers of a quilt. The illustrations are equally nuanced and complex and also utilize visual references to quilting and history. The poems range in subject matter from work to celebrations, education to freedom. The poem, North Star, for example focuses on how slaves, who were inherited by non-slavers, were often educated and highlights the North Star, which was used to navigate the way to freedom. of flax, I spun my way through Homer’s verse. send me north, lighting my way to freedom. For the rest of our recommendations for Black History month, visit our 8 by Eight page. The 8 by Eight books change every two weeks. Starting on February 14th, the new selections will focus on Teen Dating Violence awareness. The following review on Lisa Schroeder’s Falling for You (Simon Pulse, $16.99) is written by one of our long-time customers. Be sure to check this and Schroeder’s other books on display in our store. Also, our digital Poetry Contest is happening now! Details and the submission form can be found HERE. Whenever anyone asks me about novels in verse, Lisa Schroeder is the first name that comes out of my mouth. Falling for You, however, is Lisa’s first YA book told in traditional prose (with a good amount of poetry sprinkled throughout). I will admit when I heard this book wasn’t in verse I was disappointed; I was also a little nervous and wondered would it be as good as her other books? Well I am here to tell you that YES IT IS! Silly me to doubt. The book is about a girl named Rae who has a very difficult home life that she keeps hidden from even her best friends. The way she deals with this dark part of her life is through keeping a poetry journal where she lets all her emotions flow freely. I absolutely loved the formatting of this book! The book starts off with a snippet of Rae in the hospital but we don’t know what happened to put her there. The book then jumps to six months earlier, then we get another snippet at the hospital, five months later, snippet, four months, and so on and so forth. This created a great sense of tension and mystery throughout the whole book as we wonder what is going to happen to Rae. As for the characters, it was so refreshing to have such a strong, intelligent, and loving protagonist like Rae. Her love and care for others, even those who had hurt her kept surprising me. She really was a remarkable character. Nathan is the new guy who immediately shows interest in Rae. You could tell he was trouble from the first moment he opened his mouth; I just wish Rae could have seen it too! It was understandable how she looked past it though, because she had never had a boyfriend before and dreamed of having someone who really cared for her. All in all, this book was a battle between light and dark, about finding the light even in the darkest most trying times. It was emotional. It was mysterious. It was hopeful. It was wonderful.